Motocross trophies, medals and plaques are used by motocross races, tourments and championships. 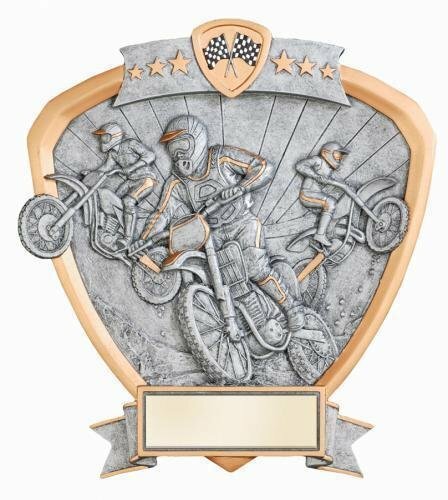 Whether you need an economy motocross trophy or a more elaborate award, we have a wide selection of motocross awards. 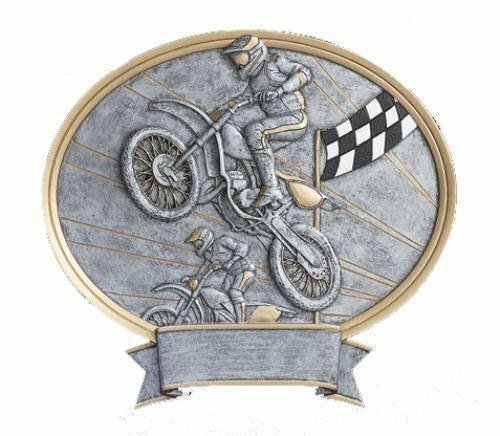 Check out our motorcycle trophies today. Free engraving is available for all awards. Lots of action is packed into this Legend Motocross Award. Several elements in the award are raised providing a 3-dimensional look. A high flying Motocross rider highlighted in gold tone is depicted while a black and white checkered flag is shown in the background to complete the scene. This oval award measures 8 1/2" X 8". A large area at the bottom of the award can accommodate your personalization needs while the gold and pewter finish complement the look of the award. This item can either be hung on a wall or placed on a desk using the included stand.